I’m always looking for more natural methods when it comes to my family and doing things around the house. Teeth whitening is no exception. If you read the post about my perspective on essential oils here, then you know I’m making a conscious effort to eliminate chemicals in our home. It’s not something I’m doing overnight, but I’m going to go through each room in the house and slowly switching out products. 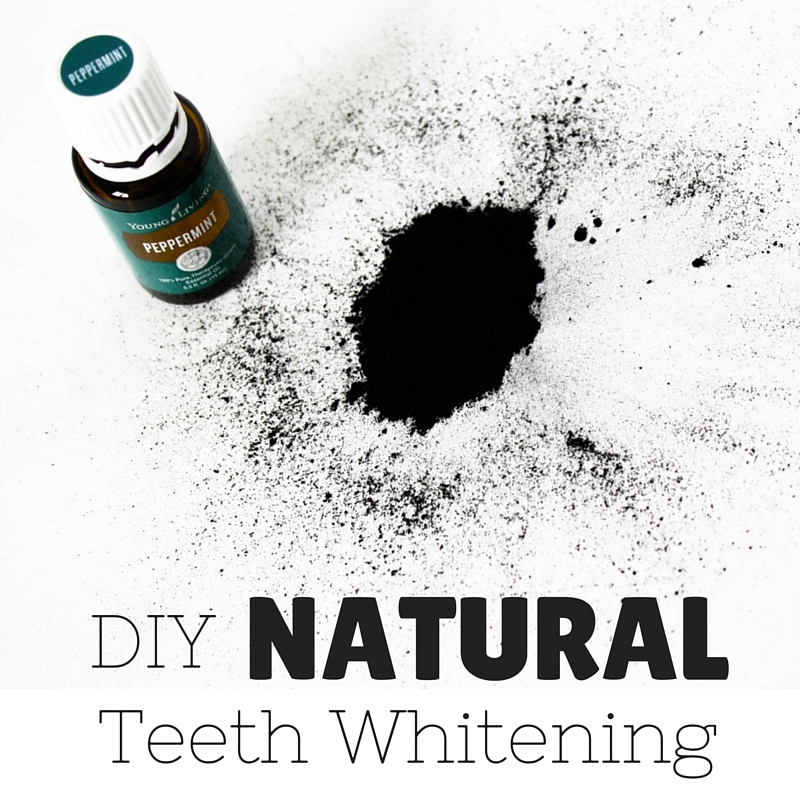 I love that this DIY teeth whitening method is natural! I’ve found the activated charcoal to be very effective and love adding my Young Living Peppermint Essential Oil to freshen it up. It’s a natural treatment used to trap toxins and chemicals from the body by absorption. It dates back to ancient Egypt. They used it as a natural detoxifier to help cleanse the body and assist with the healing process. 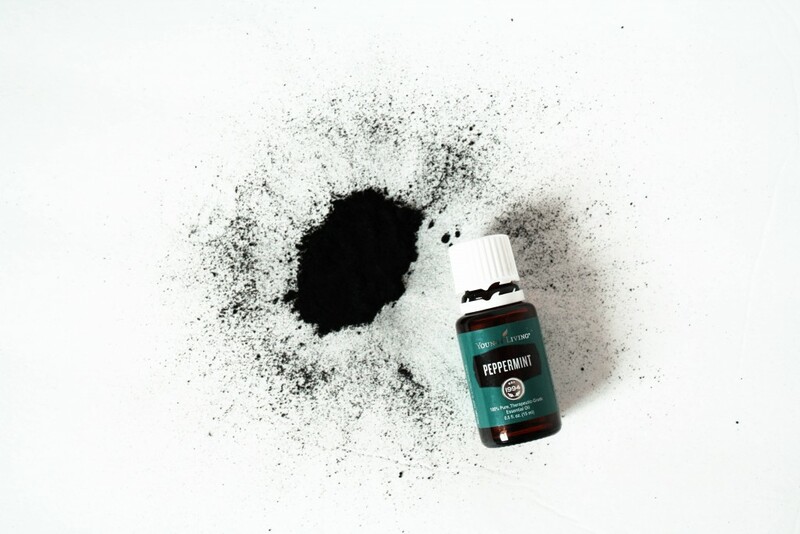 One teaspoon of activated charcoal has the surface area to cover 10,000 square feet! It’s made from coconut shells and other natural sources. So as you can see, it’s a pretty effective natural source for pulling out toxins, bacteria, and stains from your mouth. I’ve been using it for a little over a year now and will never go back to the “traditional” teeth whitening methods. Although they worked, it always left my teeth feeling extremely sensitive and the ingredients are not things I want in my mouth. 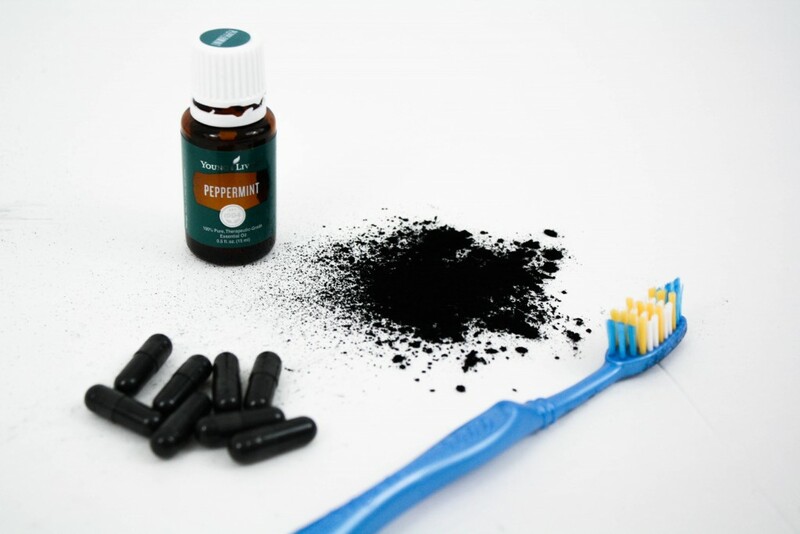 I love that activated charcoal can be used for teeth whitening without causing sensitivity!! Place your toothbrush on a paper plate or paper towel. Put one drop of peppermint essential oil on it. Empty one capsule of activated charcoal onto the brush. Start brushing and do so for about 3-5 minutes (don’t add water-your saliva will create enough liquid). Once finished, rinse your mouth with water. You may need to floss to get remaining traces of the activated charcoal out. That’s it!! I typically brush with this recipe once a day for 3 days every few months and have a noticeable difference. Be sure to take a before picture so you can see the difference once you’ve done a few brushes. If you haven’t used essential oils before, they’re pretty amazing for many different reasons! I have an awesome webinar I’d love to send you if you’d like to know more about them and how they work. Just shoot me an email at hello(at)southernmadeblog(dot)com or put your email address in the comments below. If you’re ready to dive in, get some oils, and start learning, we have an amazing members-only community where you will have continued education, be able to ask questions at any time and be entered in oily giveaways! This month I’m giving my new members $20 back and sending them a resource book! There’s no better time to make the investment! You can get your starter kit here –> www.southernmadeblog.com/essentialsoils. What brand of charcoal do you use? so interesting! I have never even heard of activated charcoal? I keep hearing orange oil is a winner, but haven’t tried that yet either! There are so many DIY recipes I want to try with the oils. I LOVE orange too!! Girl you need to share a photo of you with this on your teeth and after!! I’m dying to know what it looks like on haha! Very interesting post, thanks for sharing! Thanks sharing! Is there a reason to only do it 3 days and a month apart? Can I do it for more days in a row?